The Breanna 18-inch Dollhouse is the perfect companion for their favorite 18 inch dolls. 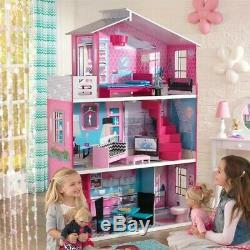 This sturdy dollhouse has large spacious rooms that are full of fun details and beautiful graphic artwork. Designed so that multiple children can play at once, it stands at over five feet tall and over three feet wide. Accommodates dolls up to 18/45 cm tall. 12 jumbo-sized pieces of doll furniture. Made of composite wooden products. Packaged with detailed, step-by-step assembly instructions. Fits KidKraft, American Girl®, Madame Alexander® and Götz® 18 / 45 cm dolls. Overall Product Dimensions:66" H x 16" W x 45 D. Product Weight: 88.2 lbs. The item "KidKraft Breanna 18 Dollhouse in Multi-Color" is in sale since Wednesday, May 11, 2016. This item is in the category "Dolls & Bears\Dollhouse Miniatures\Doll Houses".